Today's ghoulish guest is none other than Michelle of the always inspiring blog, Tenjune. 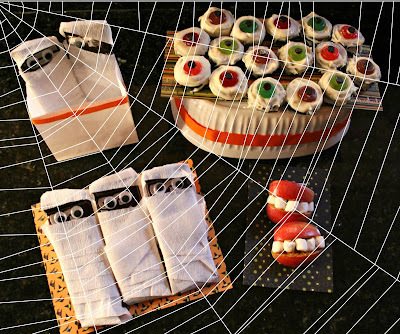 She's stopping by with an armful of goodies to add to the sweets table. When I think of Halloween, the first thing that comes to mind isn't spooky goblins or a dancing skeleton. It's not even spiderwebs or black cats. It's quite clear that I've still got a lot of kid in me because the first thing I think of when it comes to Halloween is candy. Don't you remember trick-or-treating through Halloween nights as a kid, scouring every house in the neighborhood for the best candy? My sisters and I would run back to the house afterward and spend hours sorting through our loot. And even though I don't have kids of my own yet, I like to make trick-or-treating extra special for the kids on our block. Who am I kidding... I enjoy the edibles too! With a few simple and quick projects, it's easy to turn ordinary Halloween candy into a spooky smorgasbord. I can't even get over how adorable these are. And easy! Glue a couple of googly eyes onto a chocolate bar, then wrap each bar in a thin white streamer paper. It's so easy, you won't even have to call your mummy for help. What's creepier than a decrepit skeleton mouth? Not much. 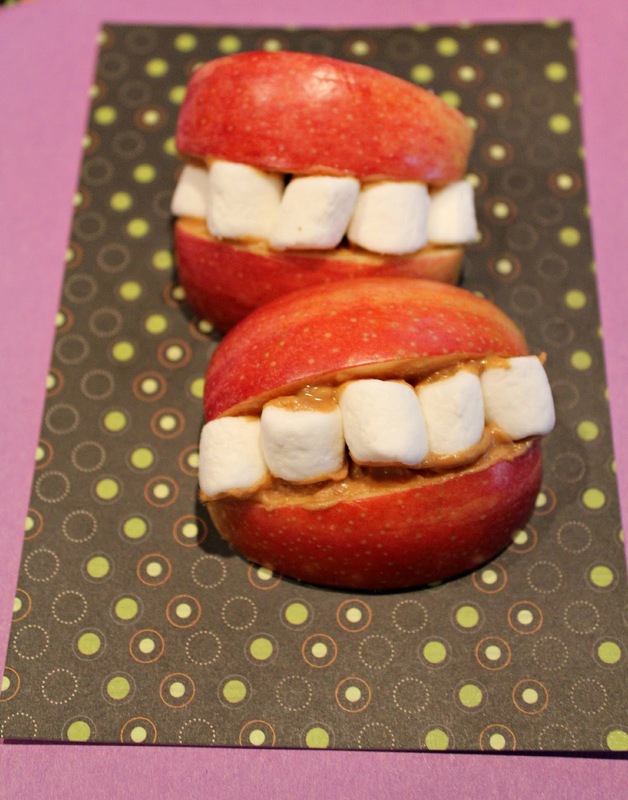 For those of us who want to push a little nutrition on the kiddos come Halloween night, this easy mix of apple slices, peanut butter and mini marshmellows will do the trick. In fact, you can scare your kids even more by telling them their teeth will look like this if they eat too much Halloween candy... EEK! How do you make "EW!" and "YUM!" fit into the same sentence? These edible eyeballs. Simply cover Oreos (I prefer double-stuffed myself!) in melted white chocolate and top with Lifesaver gummies and an upside-down chocolate chip. Cool in the refrigerator for 2-3 hours for optimum eyeball crunchiness. So there you have it! Some of my favorite Halloween candy projects. Please tell me I'm not the only one around here with a sweet tooth?! easy! 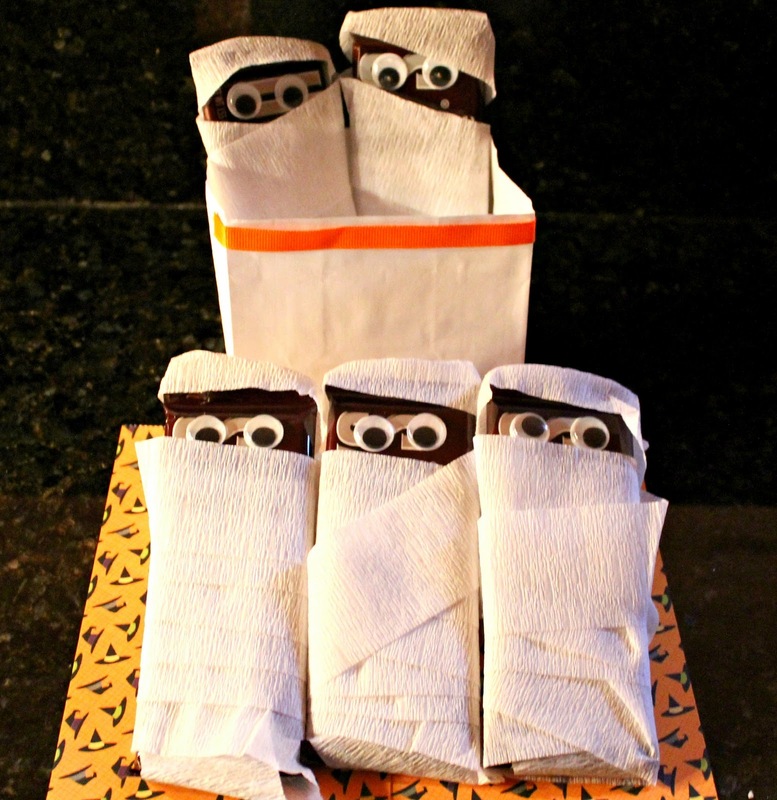 i love the mummified chocolate bars - yum! 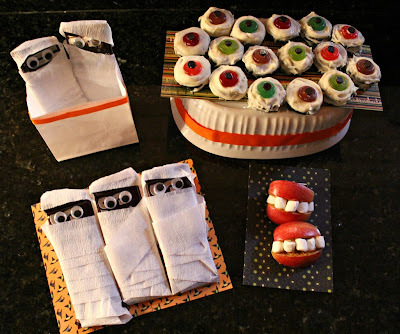 those are all awesome, but the apple mouths are my favorite!!! great ideas, michelle! Awesome ideas! My Halloween party is next weekend, and I've yet to set my menu. I think I might need to use one or two of your ideas! Such great ideas Michelle! 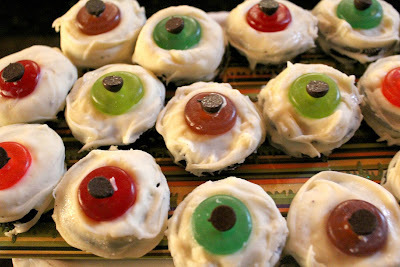 Will definitely have to test these out for Halloween! Yum, yum yum! Love those mummies! great ideas. 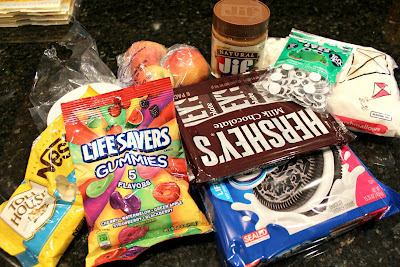 love the apples with the marshmallows! Such cute ideas Michelle! 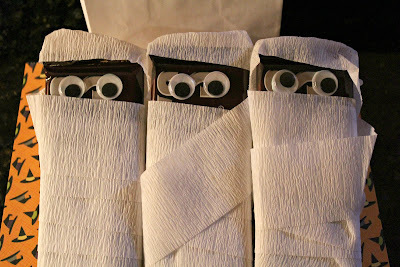 My Chloe would love the googly eye chocolate bars. 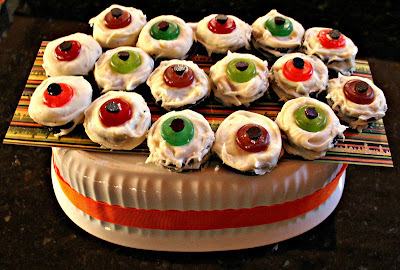 I love the eyeballs idea. I'm already brainstorming on their presentation. Lovely sweet goodies to rot ourselves with. I love the use of easily found stuff to create these things. Great job.